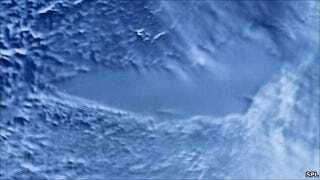 Two and a half miles under the Earth lies Lake Vostok, which hasn't seen the light of day in 20 million years. It's taken almost 20 years of drilling, but Russian scientists are about to break through and explore the lake at the bottom of the world. Vostok is thought to hold more fresh water than any other lake in the world, and is the third-largest by volume overall. To give you a sense of just how deep it is, it's kept liquid by heat from the core of the planet. And the Russian drilling is being staged at Antarctica's Vostok Station, which itself is built at the Southern Cold Pole—basically, the coldest point on Earth. Scientists are giddy over the possibility of observing life that's been completely undisturbed for millions of years, since back when Antarctica was attached to Australia. The easy joke is to wonder aloud what horrors are going to escape—Old Atlantis buried beneath Antarctica is already an ongoing Marvel Comics plot—but even scarier for the scientists on the scene is the chance that they might find nothing at all. That would be heartbreaking for the people who've spent decades doing research in an incredibly cold and inhospitable climate. And then there's the worst-case scenario: That the lake is irrevocably tainted before any research can be conducted at all. If a drill breaks too far into the water, it could contaminate samples. There could be a gaseous explosion when the drill bit breaks through, the result of which would be like shaking up a can of soda and popping it open, creating an enormous geyser and destroying much of the subterranean ecosystem. As one scientist that the Washington Post interviewed says, "If it doesn't go well, it casts a pall over the whole effort to explore this wet underside of Antarctica." But if all does goes well? The implications are unfathomable not just for the fleshing out of Earth's historical record, but the prospects of life on distant celestial bodies. Moons of Jupiter and Saturn, and presumably many exoplanets, have similar icy surfaces that might hide lakes like Vostok. And could host similar life forms. So there's a giant and ancient body of water that's warmed by the planet's molten core buried beneath the coldest point on Earth, and whatever organisms found there might lead to breakthroughs in the study of interstellar life. The Russians have been digging there for decades and are about to break through. The results could be traumatic, or life-altering or both.